During the early days of Nevada’s famous Comstock mining district, the Carson River was the nearest source of water, which could be used to operate the mills that processed the rich gold and silver ore.
A small community, known as Empire City (also called Empire), cropped up directly east of Carson City. 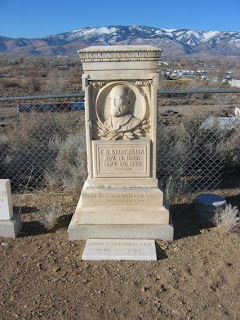 Empire City was the site of the first Carson River mill in 1859 and within a few years had nearly 700 residents. 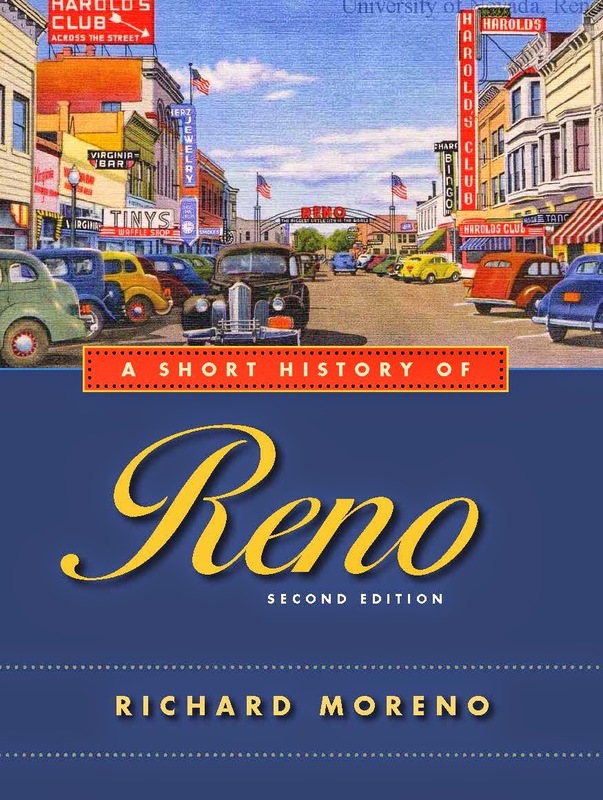 After practicing law for a number of years—he specialized in divorce cases—Roberts returned to politics in 1923 with his election as Reno’s mayor. Prehistoric rock art, which are known as petroglyphs, have long been a source of mystery to Nevada archaeologists and historians. Carved into rock walls and boulders around the state by early Native Americans, these rock writings have never been deciphered—although there are plenty of theories as to their meaning. Some hypothesize that the rock art had religious significance while others postulate that they were merely rock doodling. A few years ago, archaeologist David S. Whitley has written a book, “A Guide to Rock Art Sites,” which suggests they are most likely related to sacred rituals and in some cases involved shamanism and vision quests. Petroglyph designs often include human stick figures, animals, weapons, or geometric shapes, such as zigzag patterns, circles, or squiggles. Valley of Fire - Two impressive petroglyph sites can be found in Valley of Fire State Park, which is located about an hour northeast of Las Vegas via I-15 and State Route 169. The rock art at Valley of Fire, which dates to about a thousand years old, is particularly vivid because the images are carved into red sandstone. At Atlatl Rock, visitors can find plenty of rock art including carvings of bighorn sheep, footprints, lizards, human figures and the rock’s namesake, an engraving of a throwing stick or atlatl. At the park’s Petroglyph Trail, also known as the Mouse Tank Petroglyphs, visitors can find large panels of rock art containing patterns, human figures and bighorn sheep. Red Rock Canyon - Another good rock art site near Las Vegas is Willow Spring in the Red Rock Canyon National Conservation Area, which is located about 15 miles west of Las Vegas via West Charleston Road. Here, visitors can find panels of red handprints, which Whitley says may have reflected the shaman’s belief that the rock was a passable barrier between the supernatural and real world—and they were reaching between worlds. Another site at Rock Rock is at Red Spring. Here, visitors find a thick pattern of wavy lines and snaking patterns. Whitley believes the patterns are similar to those that appear on Indian blankets or in woven baskets. Grapevine Canyon - The petroglyphs at Grapevine Canyon, located about 7 miles west of Laughlin via State Route 163 and Christmas Tree Pass Road, are among the most dense to be found in the state. The rock walls of the canyon are crammed with various images ranging from human figures to sheep to geometric patterns. 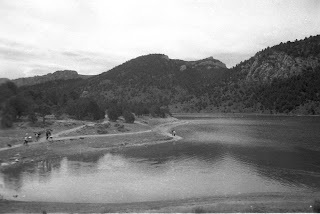 According to Whitley, Grapevine Canyon is located at the foot of “Spirit Mountain,” (today it is named Newberry Peak), a place that was among the most sacred to prehistoric dwellers. The mountain plays an important role in one of the culture’s most significant creation stories, with the canyon serving as the site of a kind of house of spirits—hence all the rock art. Grimes Point - Located 15 miles east of Fallon via U.S. 50, Grimes Point includes a mile-long interpretive trail that winds through a small forest of engraved boulders and rocks. Petroglyphs in this area date more than 7,000 years old and contain a variety of designs, which reflects the fact they were carved over several eras. A series of signs describes the theories about the meaning of the rock art and points out the different types of carvings. For example, the oldest are believed to be the most simple, having a “pit and groove” pattern. Later images include more complex designs such as a lizard, the sun, and deer. 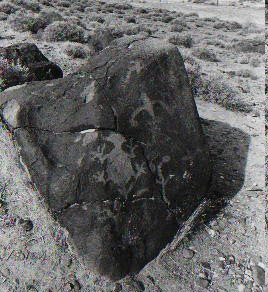 A good source of information about petroglyphs is David S. Whitley’s “A Guide to Rock Art Sites, Southern California and Southern Nevada,” published by Mountain Press. Hoover Dam may be 68 years old but it still manages to impress. Built in 1935, it remains one of the engineering marvels of the world. The addition of a new welcome center several years ago has also made Hoover Dam even more inviting for visitors. The three-level, circular concrete structure does a good job of echoing the dam's original art deco design while introducing modern amenities. The middle level is actually the entrance to the visitor center. After parking in the 400-car garage, you walk to an escalator that carries you down to the main lobby. From here, you can either be seated in a modern theater to view an historical movie about the dam's construction or line-up for the guided dam tour. Additionally, the lobby has a couple of exhibits including a wooden kayak used in 1921-22 during the survey to select the dam's location. Named "Marble," the boat was one of three used by the Southern California Edison Company and the U.S. Geological Survey to study the Green and Colorado rivers to find a suitable dam site. The 18-foot boat is constructed of oak, spruce and cedar and was designed to carried whenever the surveyors reached shallow places in the rivers. Other exhibits describe the Lake Mead National Recreation Area (created by water backed up by Hoover Dam) as well as construction artifacts and photographs. The film is fascinating because it was made shortly after completion of the dam and includes historic footage of the construction. It was photographed in black and white, in a 1930s newsreel-style—which is fun to watch—although the narration is more contemporary. Among the movie's highlights are scenes of workers riding high above the dam construction site on various platforms, footage of dynamite explosions during excavation of the site, and shots of water being diverted around the dam during construction. Tours of the dam have changed from those offered during previous decades. Instead of lining up above the dam, standing adjacent to U.S. Highway 93 and awaiting an elevator, visitors are whisked from the lobby to the base of the dam in two, 50-passenger, high-speed elevators. During the 25-minute tour, you can see the dam's massive hydroelectric generators, power transformers, transmission line towers and other equipment. You also walk 300-feet into a tunnel carved in the canyon wall, through a construction tunnel built in the 1930s, to stand atop a 30-foot diameter pipe that is filled with water rushing into the generators. 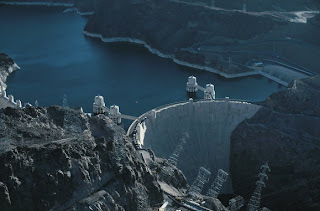 Hoover Dam is located about 30 miles southeast of Las Vegas via U.S. 93. The visitor center is open daily (except Thanksgiving and Christmas) from 8:30 a.m. to 5 p.m.
Tickets for the Powerplant Tour (the basic tour) are: $11 for adults (17-61), $9 for seniors (over 62) and $9 for children (4-16). Children under 3 are free. A more comprehensive two-hour Dam Tour is also available. Tickets are $30 per participant and it is not open to children under 8 or accessible to visitors with wheelchairs or crutches. For more information contact the Bureau of Reclamation, 702-494-2517 or go to http://www.usbr.gov/lc/hooverdam/service/index.html. While many people are familiar with the wonder of the Great Basin National Park in eastern Nevada, few know there are other beautiful recreation areas in White Pine County. For instance, one spot that combines impressive mountain scenery, camping opportunities and some of the best fishing in the state is Cave Lake State Recreation Area, located about 15 miles southeast of Ely. To reach Cave Lake, head south of Ely on Highway 93 for about eight miles. Turn right on a marked, paved road and continue for seven miles to the recreation area. Cave Lake is located in the Schell Creek mountain range, the wall of rock that is directly east of Ely. The road to the lake, called Success Loop Road, offers a hint of what's ahead. As you rise above the sagebrush carpet, you notice expressive limestone formations that stand like elegant sentinels at the entrance to the lake. You continue through a narrow canyon that leads to the lake, actually a 32-acre reservoir. The dark emerald lake is situated in a scenic niche in the mountains, surrounded by forests of pinyon and juniper. Above the lake is a small yawning cave—the namesake of the lake—and ridges of rough, crumbling granite peaks weathered by countless centuries of icy winters and hot summers. The recreation area offers a variety of activities with 20 developed campsites, showers, restrooms, a dump station, picnic areas and a dock for small fishing boats. The lake is extremely popular for fishing and regularly stocked with brown and rainbow trout—the locals point out that the state record brown trout was caught in the lake a few years ago. For those wanting a more back country experience, Success Loop Road continues above the lake, deeper into the mountain range. While unpaved past this point, it is a maintained gravel road that is accessible by most cars. Back in here, you find a number of undeveloped but usable campsites amidst some of the prettiest scenery in this part of Nevada. You pass small groves of white-barked quaking aspen and drive parallel to a small but picturesque stream. Above the road is some genuinely breathtaking mountain scenery, including carved, bowl-shaped peaks that look like glacial cirques. As I admired the view, I couldn't help but think that someday the area would be part of some kind of larger state park or wilderness area. Success Loop continues for about another 30 miles, with the best part being the first ten miles or so. If you follow it all the way, the road winds through the mountains and across a few hidden valleys before dropping back to U.S. Highway 93 near the tiny community of McGill. For more information about Cave Lake contact the Nevada Division of State Parks, P.O. Box 761, Ely, NV 89301, 775-728-4467.